Toenail fungus causes yellowing, thickening or crumbling of nails. Although the fungus usually infects toenails, in some cases fingernails can be infected. Some patients see nail color changes which can vary from brown or yellow to black or green. The fungus can also lead to streaks or spots down the side of the nail which may result in the loss of the nail. What causes toenail fungus? Yeasts and molds combine with dampness to cause toenail fungus. Wearing tight-fitting shoes or not letting feet dry out gives toenail fungus a place to grow. Other risk factors include diabetes, a compromised immune system, or an abnormal pH skin level. The likelihood of toenail fungus increases with age which leads to reduced blood circulation, and more risk of exposure. 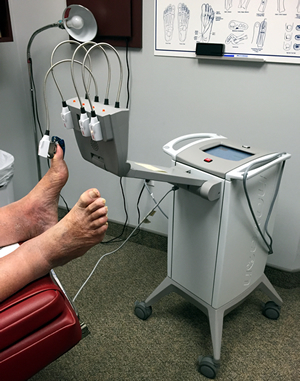 The Noveon toenail laser is a revolutionary new treatment for infected fungal toenails. It is safe and the most effective treatment available. The laser light from the Noveon is targeted to the infected toes and surrounding tissues safely and reliably. Precisely targeting the laser light is done easily with the use of "intelligent disposable applicators" attached to the toes. The two wavelengths of the laser light penetrate deep down the nail surface to reach the infected nail bed. 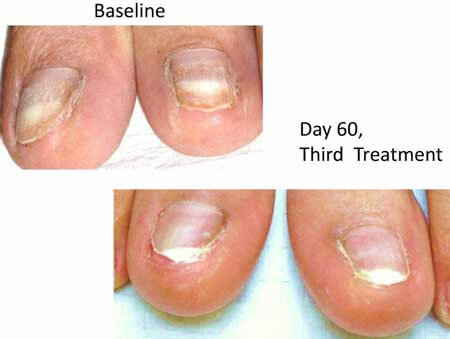 The fungus in the nail bed is inactivated by the laser light while healthy tissue is preserved. The fully automated design of the Noveon nail laser insures the correct dose is given for each treatment everytime without fail. Depending on the severity of the infection three or four treatments per toe are needed. Each treatment can be done up to four toes simultaneously in 16 minutes. Treatment with a Noveon NaiLaser takes about a half hour. First, patient guards are attached to infected toes. These guards direct laser light to the toenail, ensuring that the full nail surface is covered. An automatic program operates for 16 minutes, treating up to four toes simultaneously. After treatment there are no restrictions on your activity.